Making sure that you get the proper amount of nutrients is easy with Ultra Preventive X from Douglas Labs. This multivitamin is formulated to ensure that you get the correct amounts of essential vitamins and minerals‚ as well as several other ingredients that may benefit your health and wellness such as bioflavonoids‚ enzymes‚ amino acids‚ botanical extracts‚ and much more. Featuring essential vitamins such as C‚ D‚ A‚ E‚ and numerous B vitamins—as well as critical minerals like calcium‚ potassium‚ and more—Ultra Preventive X is formulated to prevent deficiencies in these essential nutrients and support important biological functions including immunity‚ organ health‚ bone health‚ cellular health‚ and much more. 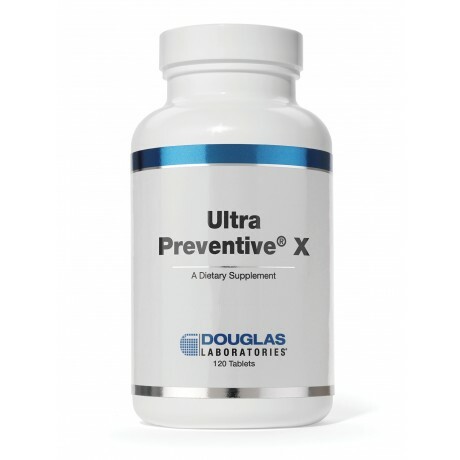 Ultra Preventive X also features a proprietary blend of fruits and vegetables including garlic‚ blackberry‚ green tea‚ and apple pectin that may help support joint health‚ mood‚ digestion, and more. What really sets Ultra Preventive apart is the numerous ingredients with possible antioxidant properties, including vitamin E and proanthocyanidins (from red wine). Antioxidants may protect the body from the cellular damage caused by free radicals‚ which are atoms that feature an unpaired electron. • Contains high potency amounts of nutrients such as beta-carotene, vitamin C, vitamin E, and B-complex vitamins that provide antioxidant protection and help support energy production, the nervous system, hormonal balance, and a healthy blood cell balance. • Is formulated using a proprietary organic fruit, vegetable, and herbal blend that contains important phytonutrients and protective sulforaphane compounds that induce phase two detoxifying enzymes. • Contains Metafolin®, a patented, natural, and instantly utilizable form of folate, which is essential for overall health and homocysteine metabolism. • Includes levels of cholecalciferol (vitamin D3) that scientists feel are critical to maintain optimal health. All ingredients are selected for long-term use after careful consideration of their absorbability, synergistic relationship with other nutrients, and allergenic potential. Selected ingredients are provided in their safest and most bioavailable forms without the danger of side effects or toxic buildup. If you are looking for a multivitamin that might do more than just provide some vitamins and minerals‚ consult your healthcare practitioner to see if Ultra Preventive X from Douglas Labs is right for you. As a dietary supplement; adults should take eight tablets daily or as directed by a healthcare professional. This product is best taken with meals in divided doses, such as four tablets with the two largest meals of the day. 700 mg Proprietary Organic Fruit and Vegetable Blend (contains the following organic powders: beet, carrot, blackcurrant, blueberry, broccoli, Concord grape, green cabbage, collard greens, mountain cranberry, kale, parsley, pomegranate, raspberry, and spinach). This product is magnesium stearate-free. It also contains NO yeast, soy protein, milk/dairy, corn, sodium, sugar, starch, artificial coloring, preservatives, or flavorings.